Nasal allergies can be caused by a variety of substances, such as dust, animals, pollen, or certain foods. Nasal allergies also go by the name allergic rhinitis, and there are many symptoms that can occur as a result. Read on to find out more about nasal allergies and whether or not nasal sprays are the solution. Normally this is a result of the air being prevented from reaching the relevant smell receptors, which are located quite high in the nose. However, it can also arise from loss of or injury to the receptors themselves. As a result of being unable to smell, a sufferer is also prevented from being able to taste. This is the most common nasal allergy symptom, and arises because tissues in the nose swell up as a result of the blood vessels becoming inflamed. The excess mucus will normally be expelled from the nose, but it can also run down the back of the throat, causing coughs and sore throat. Sometimes an uncontrollable burst of air can be expelled from the nose, and it can be bothersome if it happens too often. This is usually in response to the mucus membranes in the nose or throat becoming irritated. It is normal for the eyes to make tears consistently throughout the day, and this means the eyes do not dry out. However, when the eyes become dry because of nasal allergies, the tear ducts can overproduce, and this can lead to uncomfortable, watery eyes. Nasal sprays dominate shelves in high-allergy season, and they are often used in an attempt to stem the symptoms and prevent them from getting worse, but are they only the solution? Below is some more information about nasal sprays and their usefulness as a treatment option. 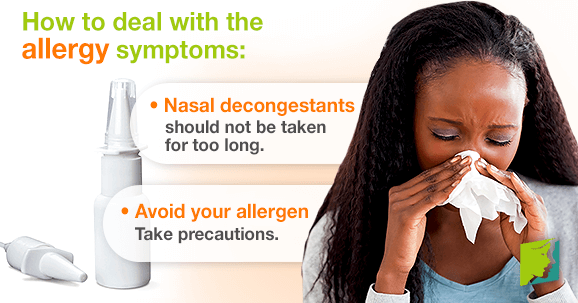 Nasal decongestants are useful as a short-term measure, because they do clear a stuffy nose and prevent the “cotton-headed” feeling that these symptoms can lead to by shrinking the nasal passages. However, they are normally not useful against very severe allergies, and should not be taken for too long in any case. They contain compounds that are not harmful in the short term, but can affect the nose's normal functioning if taken for too long. Avoiding the trigger of the allergies altogether is the best way to deal with nasal allergies, although this is not always possible. However, by taking sensible precautions, it is possible to reserve the nasal sprays for more dire situations. Nasal allergies are unpleasant, so many sufferers wish to seek effective solutions, especially women. Nasal sprays are a useful as a short-term answer, but should be used only when necessary, it better just to avoid the allergens. Non-medical options are the safest and most cost-effective solution. Read about common causes of allergies. The onset of an allergy during middle age is becoming more and more common.Incidences of adults developing food allergies are on the rise, and these include menopausal women. Click here to read more about allergy triggers. New allergies can develop – and existing ones can be made worse – by the hormonal imbalance. Allergies during menopause are increasingly common and can present themselves in different ways - such as swollen, puffy eyes. Learn about four home remedies for eyes allergies.